Cheers Tap Heads! The gentlemen are back for another round (or two) of craft beer and good times. 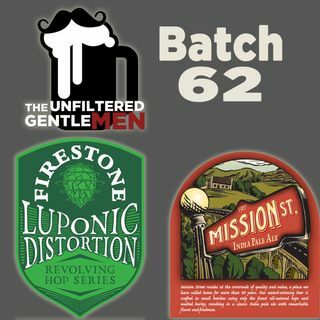 Today they’re drinking Firestone Walker’s Luponic Distortion Revolution 006; delicious, hoppy and refreshing, we’ve got the full review for you. Greg talks about having to be in his friends wedding as well as going to visit some new local breweries before they open. Scott has Tales from Uber about a guy who needed help moving his stolen stuff. In Booze News: Coelacanth Brewing has to cancel their ... See More pumpkin beer dump party, breweries are making seaweed beer, big layoffs for Budweiser, Modern Times is moving up north and much more. We're Boozin' on a Budget with an IPA that won't break the bank. Old Timey Word of the Year: "Rattlecap”. Use it on the social medias for a shout out! Make sure to check us out at www.theunfilteredgentlemen.com, www.facebook.com/unfilteredgentlemen, @unfilteredgents on twitter and TheUnfilteredGentlemen on Instagram! We want you to drunk dial (805) 538-BEER (2337), we'd love to hear from you!